This is the heartbreaking and miraculous story of Buffy, a tiny terrier who refused to give up hope. On the 30th November 2018, someone kind found a small white dog laying on the side of a Sydney road and stopped to help. Questioning if this poor dog had been a victim of being hit by a car, or a runaway from recent storms, this kind person approached the animal only to find a tiny Jack Russell Terrier in a tragic state and barely conscious. This small, vulnerable dog was mid-birth on the side of the road. One puppy lay next to her, the next stuck inside her. 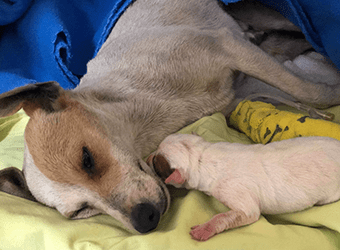 Realising the urgency of her situation, the Good Samaritan rushed this terrier, and her pup, to the Animal Welfare League NSW Veterinary Clinic immediately. These first actions of the Good Samaritan saved Buffy’s life. For the AWL NSW veterinary team, that day started like every other. Vet nurses helped around the clinic, routinely caring for in-hospital patients, preparing patients for surgery, taking phone calls and answering enquires. Veterinarians prepared for the busy day ahead with multiple surgeries and consults booked. It looked like a steady day for the team… until Buffy arrived. The 30th of November is day the AWL NSW veterinary team will never forget. On arrival, the Good Samaritan panicked at the state of this poor dog. 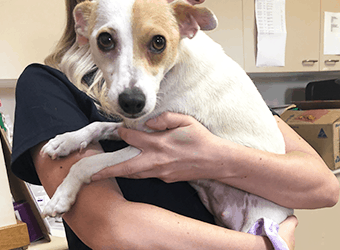 Immediately recognising the emergency of the situation, AWL NSW receptionist, Jade, grabbed the small terrier and rushed her to get the attention of AWL NSW Veterinarian Dr Deshaylia Moodley. Buffy was promptly assessed by Dr Moodley after which her team of nurses kicked into action, taking vitals measurements, placing an intravenous drip line, heating Buffy’s cold body and supplementing her oxygen intake through a mask. Buffy was immediately prepped for surgery and soon after was in theatre. Meanwhile, while some vet nurses monitored Buffy’s anesthetic, others cared for the one puppy brought in with her. Despite his mum being on death’s door, the solo pup appeared to be in good health. “When I first saw the state of Buffy, it broke my heart. She was in such poor condition. She was cold, emaciated and her white coat was covered in black grease. You could that she was exhausted, scared and struggling to hold on. I knew we had to try and help”. – Dr Deshaylia Moodley. A quick examination by Dr Moodley revealed that Buffy had evidently been trying to give birth for an extensive period of time. 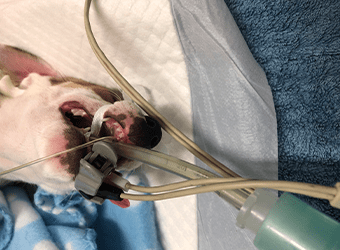 One puppy was visibly dead and trapped in her birth canal, with only its small paws sticking out of her, and more puppies were still stuck inside of her. Buffy was rushed to theatre for an emergency caesarean. This vulnerable, weak girl was a high-risk for surgery. Buffy was exhausted, dehydrated and septic which increased the chances of losing her on the table under the general anesthetic. But Buffy needed to live. Her puppy needed her. Every second was critical to save Buffy, every minute passed meant a minute closer to death. Dr Moodley and her team worked fast to defy Buffy’s fading breath. Buffy was fighting so hard to live but losing her battle quickly. What happened to Buffy is despicable, and no dog should have to suffer like this or risk their life for the sake of having puppies. We don’t know if the puppies were too big for her small body, or if other complications caused this, but one thing we do know is that this would never have happened if Buffy was desexed. Please help us continue to provide desexing services for those in need. Donations can help animals like Buffy be desexed and will help to prevent other animals from experiencing life-threatening and traumatic complications just like Buffy did. Click here to donate today. Buffy’s surgery was not easy, and one of the worse cases Dr Moodley had ever seen. Buffy’s uterus was in the process of decomposing. It was purple and green in colour instead of a healthy pink. The sight was unbearable, shocking, and Dr Moodley will never forget the gut-wrenching stench. 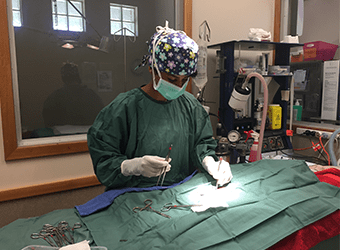 Dr Moodley and her operating team worked carefully to remove the deceased puppy blocking her birth canal. This dead puppy was full-term, stuck and literally hanging out of Buffy. Buffy’s uterus was killing her from the inside, causing blood poisoning which would soon start to affect her other organs. Dr Moodley simply could not identify how many dead puppies were still inside her during the cesarean as they too had started to rot. The large mass of rotting puppy bodies were removed from Buffy. Along with the dead puppies, Buffy’s infected uterus was also removed immediately. It was Buffy’s only chance of survival. Her tiny abdomen was thoroughly flushed to remove further harmful bacteria and infection. Even though the surgery was over, Buffy was only halfway through her ordeal and certainly not yet out of the woods. Now for her long recovery. 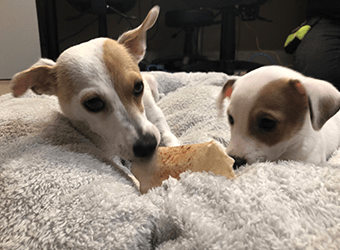 After surgery, Buffy was closely monitored through her anesthesia recovery to make sure her vitals were stable and that her condition did not get worse. Dr Moodley administered Buffy with strong antibiotics and pain relief to help her deal with the agony her body was experiencing. Buffy’s level of anaemia post-surgery was also closely monitored because if it fell below a certain level she would require a life-saving blood transfusion. Buffy was also provided heat sources as she was struggling to maintain her own body temperature. The vet team waited patiently, hoping and praying that this tiny girl would pull through. When Buffy first arrived, she was scanned in the hopes that there was a loving family looking for her, a family that had microchipped her and kept her registration details up to date. Maybe a family that had loved her? Buffy was scanned thoroughly with a microchip detection scanner. Unfortunately, no microchip was ever found, and there was no one coming for this little fighter. Donations are desperately needed to help save animals like Buffy. Just a small contribution can help Animal Welfare League NSW provide community programs to help see animals like Buffy be microchipped and vaccinated. Initially, Buffy was struggling to overcome her major operation and the shocking ordeal of losing her puppies. It took longer than expected for Buffy to recover, and she was kept on intravenous fluids for almost a week. The AWL NSW vet team performed blood tests on Buffy to see if her internal organs had coped with the trauma and that there was no other sign of infection. 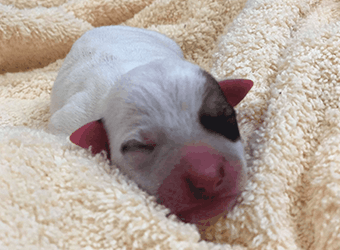 While Buffy was under close monitoring, the vet team now had a helpless little newborn puppy in their care. Buffy could not care for Rupert. She could barely lift her head or open her eyes when he cried. Adoringly named Rupert, this little male puppy and sole survivor of his mother’s heartbreaking experience, was also in need of critical attention. Rupert was bottle-fed a specific formula by caring vet nurses around-the-clock during the time of Buffy’s recovery. But what Rupert needed most, was his mother. Two weeks on from her surgery, Buffy was on the mends and finally able to look after her very excited puppy. Rupert was essential for Buffy’s recovery and helped her overcome her fear of humans. It was soon clear that this tiny girl was afraid of people being near her and was timid even with the gentlest of nurses. Her emotional recovery had only just begun. With loving care, and slow interaction, Buffy eventually began to trust the regular faces she would recognise. The vet nurses that tended to her wound, the Veterinarians who would routinely monitor her, and the volunteers who would offer her a kind hand. Slowly but surely, Buffy was learning how to receive and give affection. After learning to trust, Buffy began to reveal her incredibly sweet and gentle personality. It takes an entire team to care for these animals in need and without your support, we simply cannot do the vital work that we do. Please consider a gift to ensure we can continue to care for animals like Buffy who urgently need us in times of crisis. During her recovery, Buffy learnt how to be a typical dog. Things that we may take for granted, can be huge steps for a dog that been through something like this. When Buffy was well enough to walk, a simple exercise to be toileted was strange and unknown. Buffy had to be taught how to walk on lead, she simply did not understand, but it was beautiful to see Buffy’s confidence grow day by day. The AWL NSW veterinary team have enjoyed watching Rupert grow, learn and play. A spitting-image of his mother, this feisty and cheeky puppy has brought a smile to our faces and it’s heartwarming to know that we helped save his mother’s life. Watching the two of them interact and thrive has made their journey worth every effort. If you can, please consider a donation, no matter how small. Every dollar helps our veterinary team continue to operate and save lives like Buffy. She needed us, and we were there for her thanks to you.